Cybele, a mother goddess of Rome was at the center of a Phrygian cult, and was sometimes known as Magna Mater, or "great goddess." As part of their worship, priests performed mysterious rites in her honor. Thanks to the resurrection story of Attis, Cybele came to be associated with the endless cycle of life, death and rebirth. Cybele's followers worked themselves into orgiastic frenzies and then ritually castrated themselves. 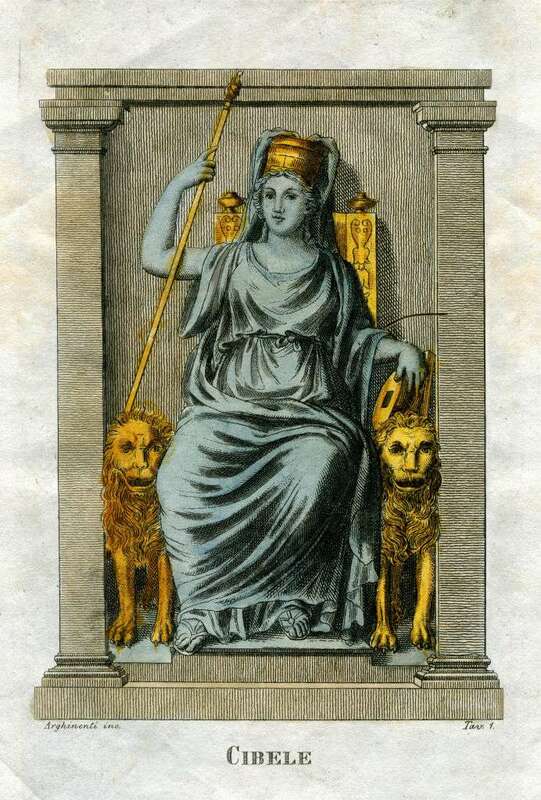 Today, Cybele has become the deity honored by a number of members of the transgender community, and an icon for many Pagan feminists. Of particular note was the sacrifice of a bull performed as part of an initiation into Cybele's cult. This ritual was known as the taurobolia, and during the rite a candidate for initiation stood in a pit under a floor with a wooden grate. The bull was sacrificed above the grate, and the blood ran through holes in the wood, showering the initiate. This was a form of ritual purification and rebirth. For an idea of what this probably looked like, there's an amazing scene in the HBO series Rome in which the character Atia makes a sacrifice to Cybele to protect her son Octavian, who later becomes the emperor Augustus. Cybele's lover was Attis, and her jealousy caused him to castrate and kill himself. His blood was the source of the first violets, and divine intervention allowed Attis to be resurrected by Cybele, with some help from Zeus. Thanks to this resurrection story, Cybele came to be associated with the endless cycle of life, death and rebirth. In some areas, there is still an annual three-day celebration of Attis' rebirth and Cybele's power around the time of the spring equinox, called the Hilaria. During an excavation of a temple site at Çatalhöyük, in modern-day Turkey, a statue of a very pregnant Cybele was unearthed in what was once a granary, which indicates her importance as a deity of fertility and fecundity. As the Roman Empire spread, deities of other cultures found themselves absorbed into Roman religion. In the case of Cybele, she later took on many aspects of the Egyptian goddess Isis. "She was the mistress of wild nature, symbolized by her constant companion, the lion... [She] offer[ed] immortality to her adherents. She is depicted in statues either on a chariot pulled by lions or enthroned carrying a bowl and drum, wearing a mural crown, flanked by lions. Followers of her cult would work themselves into an emotional frenzy and self-mutilate, symbolic of her lover’s self-castration." Today, Cybele has taken on a new role, and it's one that has nothing to do with sacrificial bulls. She has become the deity honored by a number of members of the transgender community, and an icon for many Pagan feminists. Perhaps the best known Cybeline group is the Maetreum of Cybele in upstate New York. "Our theology starts from the simplest basis: That the Divine Feminine principle is the basis of the universe. That all of us, all that we encounter is Her in the aggregate. We are all the Great Mother learning about Herself. From this simple beginning springs our organizational models, our rituals, the principles of what we call Wholistic Feminism, our mission of charitable outreach and indeed the way we, as Cybelines, live our lives."